GCCSEAL Style graphite packing made from graphite yarn cross braided. It combines all the advantages of the flexibility, compressibility and eases of installation of a conventional packing; low coefficient of friction and high thermal conductivity; extended shelf life, does not harden. Good alternative to pre-formed graphite ring. 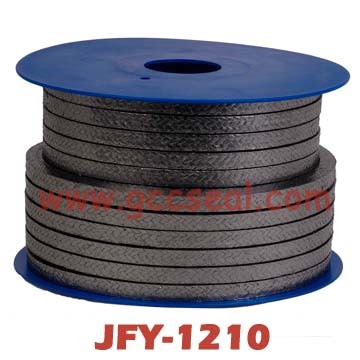 JFY-1220 Graphite packing reinforced by glass fiber ---Use the glass fiber in each strand instead of cotton fiber to reduce the loss on ignition. Rotary pumps and valves in power stations and boiler houses, in the petrochemical industry and many other industrial areas. Steam, water, fuel, gases, chemicals, mineral and synthetic oils, effluents. Suitable for all processes, except with highly oxidizing media. Provide economic alternatives to asbestos packing, reduce maintenance time and cater for very demanding duties. Due to average density is from 1.20gr/ccto1.30gr/cc only, it yields more meters per kg, which makes it very economical. Other reinforced materials are also available. Except with highly oxidizing agents.